From left: Akiyama Masumi (designer), Asaki Katsuhide (photographer), Patrick W. Galbraith (author), Andrew Lee (editor), and Akashiro Miyu (illustrator). We had a great turn out for the launch party of The Otaku Encyclopedia last Friday. The party was held at a maid café in Akihabara, called Café Schatzkiste. The poor maids were only expecting around thirty people to show up so didn't know what hit them when the hordes of otaku-bloggers, media, and minor celebrities started to poor through the doors. At least fifty people must have shown up and the place was packed. I managed to convince Patrick to show up in costume, and it was great to finally have the team who made the book together in one room. Akashiro Miyu, who created "Moé-chan" the book's cute character, made a special trip from Osaka, and it was great to finally meet her. Asaki, who took most of the portraits in the book, and Akiyama Masumi who designed it, were also there. Some of the other people who showed up included Danny Choo, who showed up in his Stormtrooper outfit, and Anno Haruna the game idol who is interviewed in the book. 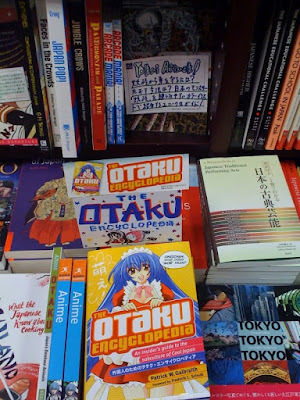 I am finally emerging from under the mountain of moé* I have been buried under for the past six months, to tell you that finally The Otaku Encyclopedia is on sale in Japan! This photo of it on display at Kinokunia in Shinjuku was sent to me just now (thanks Haru!) proving that the book has gone on sale about a week earlier than I'd been told it would be! I guess I better hurry up with the website design... but until then you can see what Danny Choo (see previous posts) had to say about the book.